Last month we talked to Joan Jacobson about her Urbanite article “The Color Line,” which chronicles a diverse block on East Baltimore Street in the Patterson Park neighborhood. Today the Marc Steiner Show revisits the article, but this time we’re talking with the residents who have made their homes on the street. Join us for a discussion of what it means to live in on a diverse block in a city that’s still very divided along racial lines. 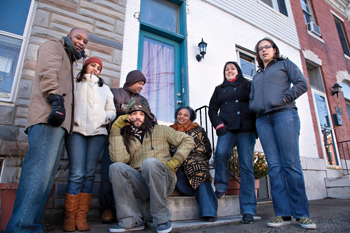 Adam Stab, an artist, and a resident of East Baltimore Street since his adolescence. Ed Rutkowski, Executive Director of the Patterson Park Public Charter School and co-founder of the Patterson Park Community Development Corporation.